(NaturalNews) Pancreatic cancer is one of the most difficult forms of the disease to diagnose and treat, and prognosis of the illness is extremely poor as it takes the lives of nearly 50,000 men and women in the U.S. each year. The pancreas is responsible for releasing digestive enzymes to aid the breakdown of food and stimulates the production of insulin to move sugar from the blood to the cells for fuel. The disease is on the rise along with the epidemic increase in new diabetes cases and obesity rates over the past half century, and most notably during the last few years. A group of scientists working at the Colorado University Cancer Center in Denver have released the results of a study in the journal Carcinogenesis, demonstrating how bitter melon juice restricts the ability of pancreatic cancer cells to metabolize glucose, thus cutting the cells' energy source and eventually killing them. In the past, researchers have shown that bitter melon juice kills breast cancer cells in a petri dish culture medium. This study provides compelling evidence that the natural extract effectively neutralizes pancreatic cancer cells. Lead study author, Dr. Rajesh Agarwal commented, "We used the juice... people especially in Asian countries are already consuming it in quantity. We show that it affects the glucose metabolism pathway to restrict energy and kill pancreatic cancer cells." Scientists became interested in the connection between pancreatic cancer and bitter melon juice because diabetics are known to be at much higher risk of developing the disease and bitter melon has been shown to affect diabetes through centuries of use in China and India. Noting that bitter melon juice may provide a natural treatment to pancreatic cancer that avoids the use of toxic pharmaceuticals, Dr. Agarwal concluded, "It's a very exciting finding... many researchers are engineering new drugs to target cancer cells' ability to supply themselves with energy, and here we have a naturally-occurring compound that may do just that." Closely monitoring body weight and sugar intake to avoid metabolic dysfunction may help to protect against pancreatic cancer. 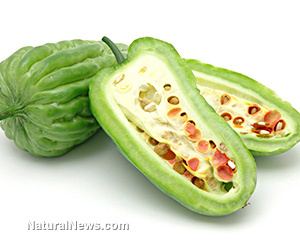 Health-minded individuals may want to supplement with bitter melon extract (500 mg/day) to provide an added level of protection against this devastating disease.